Cool Water Acres is located 5 miles from downtown Bandera, Texas and encompasses 54 acres of beautiful Texas Hill Country. We offer a Bed and Breakfast Cabin for short stays and a Vacation Rental Home rented monthly. 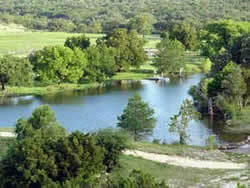 A private seven acre spring fed lake provides cool clear water for swimming, fishing and relaxing. 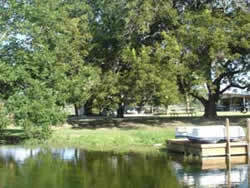 The lake was built in the 50’s around a dam on Indian Creek and ranges in depth from 1 to 20 feet. Most of the year overflow waters from the underground springs in the lake, pass over a spillway and meander their way to a dramatic 15 foot waterfall and pool. Bass, sunfish bluegill and catfish are plentiful and easily caught when they’re in the mood. Two floating docks provide for fishing and sunbathing. Fishing poles are provided as well as a two person pedal boat for exploring the lake. A small electric powered bass boat is available to serious fisherman. 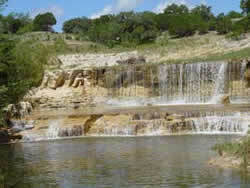 The rest of the ranch topography contains varied terrain and elevations which make for wonderful hiking excursions. The quarry, from which the material for the dam was taken, was an ocean floor millions of years ago and sea fossils abound. Another part of the ranch runs through a cool tree covered draw, where it is common to see deer, turkey, and armadillos. You can hike to a high lookout ledge once used by Indians and view the beautiful valley and surrounding hills.